Convection ovens are warmer and cook food quicker than a conventional oven. Why? In a conventional oven, the baking element is located at the bottom causing heat to rise to the top of the oven cavity. Food placed on the upper rack will cook faster than food on the lower rack. The convection oven has a fan that evenly distributes the heat around the food no matter what rack it is placed on. Let’s say you want to bake a few dozen chocolate chip cookies in a conventional oven. Because of the uneven distribution of heat, in order to bake cookies that have the same consistency, you know you can only cook one or two pans at a time. Cooking one rack at a time of 15 cookies each time means you could be at this project all day long. The even distribution of heat of a convection oven means you can cook as many pans of cookies that your oven can hold without the fear of the top batch cooking more than those on the bottom rack. Moreover, food in a convection oven cooks food about 30% quicker. 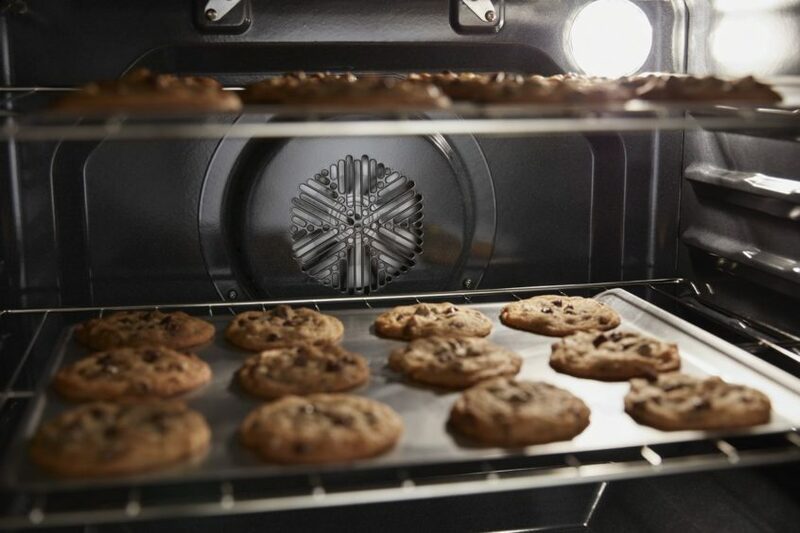 The overall efficiency of a convection oven, according to the US Department of Energy, could use about 20% less power annually than a conventional oven. On the other hand, it is worth noting that souffle’s and lemon meringue pies and other delicate desserts do not cook well in a convection oven because of the moving air caused by the convection fan. You don’t want to serve a souffle that looks like it just came out of a blustery squall. Consumers began using the convection oven during the 1950s. Who would have ever thought that a simple fan strategically placed in an oven cavity could do something as wonderful as evenly distribute the heat produced by the upper and lower heating elements? The benefits of convection oven cooking are many. We are highlighting a few. Be sure to add to the comments section below how convection oven cooking has made your life better. Cooking time is shorter, approximately 25-30% shorter. Food cooked on the lower rack cooks at the same rate as food cooked on the top rack. Convection oven cooking uses less energy, saving consumers money and applying less pressure on energy sources. Food cooked at a lower temperature and for a shorter period of time yields more nutritional value. Prevents food from drying out while cooking. Food is cooked all the way to the center. There is not a cook anywhere that hasn’t experienced a pie that on the surface appeared to be ready to come out of the oven. But after the first slice, it was revealed that the center was undercooked and soggy. Probably the greatest benefit of convection oven cooking is the reduced amount of time that it takes. Additionally, you can fill the oven cavity with as many items that you need to cook without the fear of any one thing cooking more or less than the other. In order to access the convection fan motor, the double oven needs to be removed from its cabinet. Since the electrical outlet the oven is plugged into is located behind the oven, you will need to shut off its power at the circuit breaker. Open the top door and turn the door hinge locks away from the oven. Position the door at a 45-degree angle and lift it from its hinges. The door is quite heavy. Set the door face down on a blanket. Remove the bottom door the same way as the top door. Remove the Philips screws that secure the bottom vent. Remove the vent and set aside. Pro-Tip: Place all screws you remove in a container so you can easily locate them later. Remove the 4-screws that secure the oven frame to the cabinet. With someone to help you, slide and lift the oven out from its cabinet and set it down on a piece of cardboard. Please Note: If the conduit cable is not long enough to allow access to the rear of the oven, remove the power and ground wires from the junction box. With a ¼ inch nut driver, remove the screws that secure the rear access panel. Do the same with the lower access panel if you plan on replacing the lower convection fan motor. Remove the convection fan covers. Pull the cover up to remove it from its slots. Use a ½ inch socket to remove the locking nut that holds the fan in place. Unthread the nut clockwise. Remove the fan blade. Use a piece of wire to hold the fan motor in place. With a #2 square drive bit, unthread the 3-screws that hold the motor to the rear of the oven. Remove the wire you’re using to hold the motor in place. Disconnect the power wires from their terminals on the convection fan motor. Remove the old convection fan motor. Remove the fan shield from the old motor and transfer it to the new motor. Connect the power wires to the terminal on the new motor. As before, use the piece of wire to hold the motor in place. Replace and tighten the 3-screws that hold the motor in place. Line up the fan on the new motor and thread the locking nut counterclockwise and tighten. Replace the cover by inserting the tabs into the rear panel slots. Lift the cover up, replace and tighten the screws. With the ¼ inch nut driver, replace the rear access panels with the appropriate screws and tighten. Once again, recruit a friend to help you lift and slide the oven back into its cabinet. Ensure the holes in the side trim pieces match up to the holes in the face of the cabinet. Replace the 4-screws to secure the oven. Replace the bottom vent and tighten its 2-screws. Return the oven doors to their designated hinges slots at a 45 degree angle. Remember to re-lock the door hinges. Lower each oven door to an open position and then lock the door hinges by revolving them toward the oven. Now that the repair is complete, flip the breaker switch on and bake your favorite dish using your new convection fan motor. Any questions or comments? Feel free to contact us.